Lessons learnt at the International Meat Secretariat Marketing Workshop 2019: Part 1. The International Meat Secretariat hosted a workshop for the International Meat Marketing group in Canada this past March to further develop the powerful body of institutional knowledge within the red meat marketing circles to facilitate discussions around current challenges and solutions within the global meat narrative. All jokes aside, the meat alternatives industry is here to stay. Guest speaker, Anne Lacey, an international consumer market analyst from Antedote Inc. suggested that the current meat industry should look at the “meat alternative” industry as an opportunity for meat product companies to gain a bigger market share, in a new industry. She explained they found that, in the United States, there are two significant groups who purchases products like “The Impossible burger”. The first one being consumers who are curious to try it but with no intention to cut out meat on their entirely, and secondly consumers who have been established vegetarians or vegans even before all these meat imitations appeared on the market. Getting involved in this market will thus mean “gaining” these consumers buying power back, and getting a bigger cut of consumer’s expenditure in the protein foods category. She discussed how the dairy industry is a good example of a traditional food industry that had to rethink their significance in the millennial world. Almond milk, Coconut milk, Rice milk, cashew milk, only to name a few, has made their way into coffee cups and breakfast cereals in many developed countries. It is obvious that the dairy industry had to adapt to change and expand, or risk losing market share to dairy alternatives. In fact, one of the dairy market leaders, Danone now owns the milk alternatives brand “Silk”. - A balanced diet is the best diet. The South African Food Based Dietary Guidelines recommends that fish, chicken, lean meat and eggs can be eaten daily and that dry beans, lentils, split peas and soya can be consumed regularly. - South African lamb is safe and of good quality because we have excellent role players throughout the entire value chain. - The entire lamb carcass can be used from tip to tail to make a variety of delicious dishes that fits in your skill set, budget, healthy eating habits and culture. Lamb is the crème de la crème of all the meats from the Karoo and people visit from all over the world to taste it. As a chef, I love cooking lamb, from shanks and stews to roasts with whole cloves of garlic pressed into the flesh. They say the nicest meat is closest to the bone, an ethos I wholly subscribe to and a Karoo lamb neck, slow-roasted in the oven or in a kettle braai is such a treat. Sticky lamb ribs are an all-time hit too and no holiday trip would be complete without a lamb and mint pie as padkos (food for the journey). But first let’s clear up a few misconceptions regarding lamb. You will note that the heading of this article refers to lamb and mutton. Although people tend to refer to both as lamb, there is quite a big difference. In the Karoo, lamb tends to be exactly that: a young sheep roughly 1 year old with less than two teeth (twee tand as they say locally) and weighing around 40 kg (live weight ). It is graded A or AB, with a classification number of 1 to 6 (with 1 being very thin and miserable, and 6 being really fatty). I use grade AB 2 or 3, which I consider the best grade lamb, as it comes from a young, fairly well developed animal with a 4–5 mm layer of fat and good meat to bone ratio, i.e. not too much bone and good meat coverage. Mutton comes from an animal older than 1 year, that is larger than a lamb and more developed, and has 2 to 6 teeth. It falls into the B and C categories and is classed from 2 to 3. A good quality buy for mutton would be graded, for example, B 2. Whilst lamb tends to be much tenderer than mutton and is used by restaurateurs for their prime cuts, mutton has way more flavour but generally needs a longer cooking time. Either way it’s a compromise between tenderness and flavour, so think about what you want to do with the cut before deciding what to buy. A tender chop on the braai (barbecue) should be lamb, but mutton is the best choice for a tasty winter casserole or stew. When in doubt, ask your butcher. I recommend you find a local butcher who is approachable and helpful and build a good relationship with him or her so that you get decent advice while at the same time supporting a local neighbourhood business. Now that you know what to look for when buying lamb, you need to know what makes traditional Karoo lamb so special. The not so big secret about Karoo lamb and mutton is that it is raised and lives entirely out in the veld. It very seldom has any form of supplementary feeding, unlike most other livestock, and the old adage of ‘you are what you eat’ rings absolutely true. The Karoo is situated in an arid semi-desert region which, at first glance and to the untrained eye, looks like nothing much at all. In reality, however, it is a massively rich and diverse environment that has developed over millions of years and is teeming with life. The veld itself is a rich array of shrubs, grasses, succulents and wild herbs, including various forms of wild rosemary, camphor, lavender and sage. Essentially, what all these plants have in common are high concentrations of terpenoids and other volatile oils. Plant terpenoids are used extensively for their aromatic qualities and in traditional herbal remedies. The combination of unique plants, climate, geography and the extensive method of free range farming contributes greatly to the unique Terrior of Karoo lamb. AH Yes, that quintessential and mystifying ingredient that no Karoo dish worth its salt could do without. Sublime lamb or mutton from the heart of the Karoo has been the staple of Karoosters for hundreds of years and is arguably its most famous export. Revered around the world for its flavour and free-ranging hardiness, the humble Karoo sheep is unique in all the world. Farmed by the hardworking and humble people of the land, it is a treasure of this region that cannot be matched or equalled. What a privilege it is to have regular access to meat of such excellent quality. When you are working with top quality meat with a magnificent flavour all of its own, your sole job, really, as a cook, is to do it justice and, if you’re honest, to not bugger it up. There is no need for fancy sauces and marinades to drown out or add flavours; a fresh herb or spice to enhance the existing delicious flavour is really all you need. What truly makes Karoo lamb stand out from the rest though is the unique flavour profiles of the meat caused by what it eats and the type of free ranging life it lives. The Humble Karoo Bush (Penzia Incana) is probably the most famous of all the Karoo plants, as eating this is what imparts the distinct flavour to the meats of the Karoo, however, this little bush is not completely dominant in all parts of the Karoo and a variety of other species and genus are also present across the vast region. Plinthus karrooicus ("Silverkaroo"), Pentzia spinescens ("Skaapbossie"), Eriocephalus ericoides ("Kapokbossie"), Salsola glabrescens ("Rivierganna") and Pteronia glauca / Rosenia humilis ("Perdebos"). Just within a 100km radius of where I live, close to the picturesque town of Graaff Reinet, are a huge variety of bushes, grasses and shrubs that have a significant impact on the flavour profiles of our lamb. The Lamb from the farms of the South and West (in terms of Graaff Reinet) eat a lot more Karoo Bush and Ganna, which gives a much stronger and more flavourful lamb, whereas the mountainous farms in the North have a lot more Rooigrass and Kapokbossie, which is responsible for the more delicate and softer flavours of the lamb and mutton from those areas. And this within a mere 60km of each other. If you head up to the Northern Cape Karoo towards Carnarvon and Williston then you will have an altogether different taste experience due to the abundance of silverkaroo and Perdebos, to name a few. Now combine this habitat with a dry semi desert climate, hot summers and cold winters and not much rainfall with have a predominance of indigenous vegetation rather than grasses (which only grow in summer) and you have a perfect storm. One where the sheep literally flavour themselves from the inside. Essentially, due to the extensive nature of the way traditional Karoo sheep are farmed and naturally grazed off the veld and the fact that they do not end up in a commercial feedlot and fed maize and supplements, Karoo lamb and mutton retains it’s uniqueness and wonderful flavour compared to a feedlot animal. Unfortunately, due to commercial pressure, predators and the basic economics of the consumer not being prepared to pay a premium for premium lamb or mutton, the traditional Karoo farm in under threat and more and more sheep are being taken off the veld and stuck into commercial feedlots. The result will be a nullifying of all the good holistic farming practises and happy free range animals that have been the norm in the Karoo for hundreds of years and the introduction of mass commercial factory farms that are detrimental to the Farmer, the consumer and our planet. We really need to fight this trend and support the traditional Karoo farming methods, even if it means eating less lamb or mutton but of a much better quality. Most of my farmer friends are lamb and mutton producers and they would much prefer to continue farming their lamb in the traditional way but they are being forced by these circumstances to change in order to keep the wolf (literally) from the door. By voting with our wallets and buying only traditionally farmed Karoo lamb we can all make the difference . As discussed earlier, the most basic difference between lamb and mutton is age. A lamb is young, the meat is tender and it has a very delicate flavour. Perfect for braising, quick cooking or gentle roasting. Lamb is ideally served with a bit of a pink hue to it and light spicing. It is classed as A grade and commands the highest price, mainly due to its tenderness. Mutton, on the other hand, is an older animal with a lot more flavour. It is tougher though, so it does well with lots of added spicing and longer cooking times, perfect for stewing and slow-roasting. It is classed as either B or C grade and is usually the cheapest of the lot. A serious bargain if you are planning to do a good curry or slow roast. In between the two is the much forgotten and seldom seen ( and often cheaper) two-tooth or hogget. This lovely compromise between lamb and mutton is both tender and flavoursome. I like to call it “the farmer’s choice” as these are the sheep they tend to be the ones they keep for home use. The best of both worlds and my first choice every time. Hogget is easily identified at the butcher with the AB certification stamp on the carcass – you don’t see it often but if you do, grab it. This unique combination of holistic extensive farming practice, good natural diet and lots of fresh air (Terroir) and exercise gives Karoo lamb and mutton its characteristic and unmatched flavour profile and makes it every cook’s dream to work with, as very little needs to be done in order to bring out the best flavour. When planning your dish or braai it is important to have the correct cut or type of meat for the purpose. A nice heavily spiced Curry will be best suited to mutton, whereas a tender chop on the grill should be Lamb. Generally, the most tender cuts (Read – least flavourful) are the ones from muscles that don’t work that hard, loin chops, fillets etc and require the same respect as a steak – they require a very quick and minimal cooking over high heat with limited use of spices. The more hard working cuts, shoulders, neck, shanks etc, have a lot more flavour but also require a lot more cooking time. So low and slow is the key here. The upshot is that they can carry lots of spices and flavours and are well worth the effort. 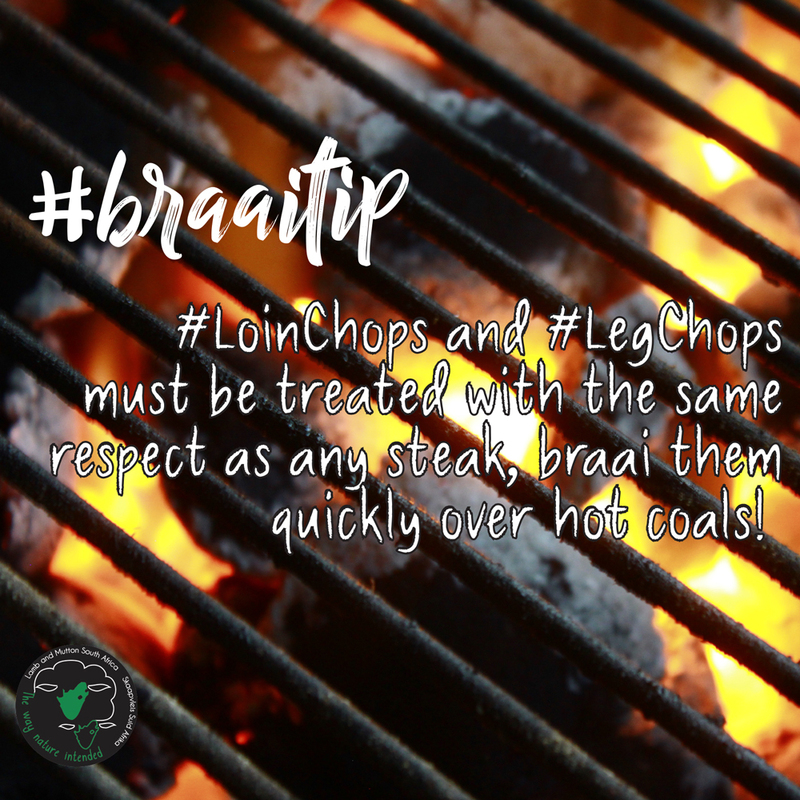 A nice hint for succulent, falling off the bone ribs is to smother in lemon juice and pre cook for 60mins in the oven at 180 Deg C. Finish off over moderate coals on the braai until the skin starts to crisp to ensure that awesome smoky, lamby taste. It is hard to describe the flavour of Karoo sheep if you have not tasted it. It makes all feedlot lamb and mutton appear bland and boring. The head of The International Slow Food Movement, Carlo Petrini declared it “The best lamb in the world” when he tasted it on a recent visit to these fair climes. The natural herby flavour with just a subtle whisper of Rosemary and Thyme and a hint of garlic that just begs for a lovely glass of deep red Shiraz to finish it, like two lovers in tight embrace. That, my friends, is the Terroir of Karoo lamb and mutton and why it is a national treasure. Gordon Wright is a Chef , author and passionate Karooster who loves to tell the occasional tale , cook a lamb chop on the braai and sip the odd glass of good wine under the Karoo sky. Die twee belangrikste dinge om te verstaan as dit by skaapstertjies kom is dat dit ‘n stukkie vleis is wat bietjie voorafbereiding verg en dat dit definitief nie in die nuutste verslankingsdieet gaan verskyn nie! Maar dit beteken nie dit steek af by ander snitte nie, en is ook glad nie soveel moeite as jy dit nou en dan vir ‘n spesiale geleentheid maak nie. Dis eintlik so eenvoudig soos ‘n pot kokende water op die stoof! Party mense stel voor mens kook die stertjies in soutwater omdat die temperatuur van die water dan hoër is, waar ander weer ‘n goeie ou stoompot verkies. Ek persoonlik is bietjie versigtig vir ‘n stoompot en het nog nie ‘n elektriese stoompot in my trousseaukis nie, daarom verkies ek ‘n pot met kookwater op die stoof. Dit vat so 90min vir skaapstertjies om sag te kook, en as dit wegtrek van die beentjie af is dit reg om uit te die water, en op die kole te kom. Dit was Oom Francois (Floors) Botha van die Vrystaat se skaapstertjies wat my guns die eerste keer gewen het. Oom Floors het hierdie jaar by die Bloem Skou groot naamgemaak met sy skaapstertjies wat hy sorgvuldig by die huis gedokter het voor hy dit by die skou kom braai het. Volgens hom lê die sukses van ‘n stertjie nie net in die “pre-cooking” nie, maar ook in sy sous. Nie noodwendig die tipe sous wat jy by die stertjie sit nie, maar meer die tydsberekening van die sous se byvoeging. Oom Floors vertel my hy het per toeval uitgevind het, toe hy haastig ‘n hele klomp stertjies moes voorberei, dat dit goed werk om die vuurwarm stertjies wat uit die stoompot of kookwater kom direk in die sous te sit en net so te vries. Dis asof die warm stertjies die sous opsuig en dit dan goed behou as dit weer ontvries en gebraai word. Skaapstertjies is ook glad nie ‘n vreemde gereg vir Noord-Kapenaars nie. Hier het ek by die “Williston Mall” se restaurant heerlike Karusaf skaapstertjies geëet. Hierdie heerlike karoo skaapstertjies was goed vooraf saggekook en toe net oor die vuur gebraai totdat die buitekant lekker krakerig was, met net sout en peper oor, sodat mens nog die heerlike geur wat eie is aan skaapvleis uit die karoo kon proe. Daar was ook groot feesgevier met skaapstertjies by hierdie jaar se Hantam Vleisfees in Calvinia. Al was daar 4 verskillende stalletjies wat skaapstertjies gebraai en verkoop het, was daar nie ‘n enkele skaapstertjie oor in Calvinia na 2uur die middag nie. Skaapstertjies is verseker die gunsteling “feeskos” op die platteland, wat maklik in die loop geniet kan word deur oud en jonk! Na my besoek aan die Noord Kaap was ek baie hartseer dat stadskinders so moet uitmis op een van die lekkerste bederfies wat uit ‘n skaapkarkas kom. Ek het bietjie gaan ondersoek instel oor waar mens skaapstertjies in die stad kan kry. Dit is nie sommer ‘n produk wat op ‘n supermark, of selfs ‘n stadslaghuis, se rak lê nie so ek moes lank soek voor ek by die manne van “KLH Oos-Kaap Lam” uitgekom het deur hul sosiale media blad. Hierdie manne het as studente agtergekom die aanvraag vir “die 5de kwart” in die stad is genoeg om goeie besigheid mee te maak, maar die produkte is nie naastenby so maklik bekombaar soos in die platteland nie. Hul het hierdie geleentheid aangegryp en met ‘n waentjie die langpad aangepak en by ‘n paar kontakte by abattoirs skaapafval, skaapstertjies, beesstert en beestong aangekoop. Die stadsjapies het hierdie produkte soos soetkoek opgeraap en hierdie manne bedryf jare later steeds deeltyds hul 5de kwart besigheid in die stad vanaf hul Facebook blad. Ek dink dit is net ‘n kwessie van tyd voor die “food market” kultuur in die stad skaapstertjies beetkry, tot dan lyk dit my skaapstertjies is een van die beste geheime wat die platteland inhou! Sheep in the winter are more than just a woolly knit! I am currently on a culinary journey to discover the new and classical uses of the delicious cuts of lamb and mutton and to experiment with it. In this series I discovered and got acquainted with the leg of lamb, shoulder and tails (Red Meat Magazine December 2016, February and April 2017) but a few surprises still remains on the lamb and mutton carcass! Join me on this journey! I do not like the winter. There are too many dark hours in the day, you need to dress and wrap up like an ancient mummy just stay warm and your favourite summer fruits are only available on the pages of December through February’s food magazines! I am whole heartedly convinced that we as South Africans are designed and made for the summer sun shine and therefore need something extra to make us feel warm and fuzzy from the inside during the winter months. I am not talking about the trusted comfort of Old Brown Sherry (although it does help), but about a lekker lamb stew, breyani or potjie. So, with an open mind and no idea which cut to use, I went to my favourite butchery. To my surprise the first cut my butcher suggested was a whole sheep’s neck. He believes that if you want red wine, you drink it out of a glass and if you want to cook tomatoes, you put it in soup, and I tend to agree with him. He describes neck as a “self-saucing pudding” which only needs a little of the correct liquids to ensure you have a tender and succulent piece of meat after a few hours. I decided to use my favourite staple ingredients in my first attempt to cook the perfect lamb’s neck (well, I had three…), these ingredients are fresh lemon juice, some white wine, a cup of strong brewed Rooibos tea, and spice mix of cinnamon, aniseed, ginger and cumin. Exactly like most recipes suggest, I closed the casserole and went on with the day as the meat simmered in the liquid and spices mix. I will be honest, after about three hours, I started to get a bit worried about this stiff-necked situation (I really need to invest in a proper pressure cooker for my kitchen). After the fourth hour, all my concerns melted away as the tender meat literally fell off the bone, ready for tasting! It was love at first bite. The taste is almost difficult to describe. While the leg of lamb had a subtle elegant taste, and the shoulder was a bit sweeter, the neck has the very satisfying taste described as umami. Umami is the savoury taste sensation you experience from eating brown onion soup or Marmite, the only difference here is that the neck produced this flavour without the addition of any artificial flavour agents. The average weight of a sheep’s neck (from a C2 lamb) was 792g, and reduced to a cooked weight of about 360g. The meat easily came away from the bone giving you the perfect pulled lamb for any tasty dish. I decided to use the pulled lamb in a bowl dish, served with winter vegetables (sweet potato, butternut, carrots, and onions). This pulled lamb will also work very well with any pie, pasta, pita or sandwich recipe! The other cut suggested by the butcher, is the trusted winter favourite lamb shank, cut into smaller pieces. His first recipe suggestion to use this with, was a good old potjie. The trick and secret to a successful potjie is to leave it alone! This will give the fresh vegetables and herbs a fair chance to marry with the flavours of the shank. I had a different idea, and decided to try something a bit more exotic but still true to the flavours South Africans love. This idea however required a stop at a different store - a local Indian spice shop, where an elderly lady combines a mix of secret herbs and spices called “Garam Masala”. Within this mixture you can find coriander, cumin, mustard and cardamom seeds, ground cinnamon, nutmeg, chillies and cloves. Compared with the neck, the shanks had a wilder aroma for this city-girl, when I opened the packet. This might be the reasons why our Australian neighbours like to tell stories of this cut (now sold at higher prices) being used for dog food. Luckily I remembered an old tip my aunt taught me, to rinse the shanks with warm water, to get rid of the strong wild smell. I would not categorise lamb shanks as a cut to use in stews. Stewing meat sounds as if it should be tough and have a bone, which will take days to cook. The meat to bone ratio of these lamb shanks were good and did not take more than two hours to simmer in the meat stock. In preparing the meat, I sprinkled it with lemon juice, rolled it in the masala mix and quickly browned it in a hot pan. I then placed the shank pieces in a pot with homemade meat stock with a bit of tomato paste, and some more of the masala mix to taste. I placed the lid on and left it alone, only stirring to prevent burning. After about 90 minutes, my shank curry was tender, full of flavour, and just right for my exotic Bunny-chow bowl. To me, lamb or mutton curry is synonymous with Bunny-chow – an Indian dish which is sold in almost every restaurant and café in Durban. Traditionally Bunny-chow is a lekker saucy and aromatic curry inside a hollowed out bread, topped with slap chips. My Bunny-chow bowl is a healthier version of this favourite. I stay true to the curry, with my lamb shank curry, but replace the bread and chips with croutons (roasted bread cubes) and oven-baked orange sweet potato slices, and added some fresh coriander leaves. The croutons and sweet potato slices are very easy to make and can be roasted in the oven at the same time. I sprinkled the bread with olive oil, salt and pepper before roasting it to golden perfection. Place the sweet potato slices in the bottom of the bowl and dish the shank curry on top, garnish with croutons and fresh coriander leaves. You can also add steamed green beans or sugar peas to the curry for added fibre and nutrients! I am pleasantly surprised with the versatility of these two lamb cuts, and I am looking forward to cooking and experimenting with winter recipes for neck and shanks. Please send me an email (posbusmarina@gmail.com) with your favourite recipes, and ideas or post it on our Facebook page at “Cooking with Lamb” or “Budget cooking with Lamb”. Be on the lookout for great recipes on www.cookingwithlamb.com to keep you warm and fuzzy this winter! Put your shoulder in it! I am currently on a cullinary journey to discover the new and classical uses of the delicious cuts of lamb and mutton and to experiment with it. The one cut I really did not want to cook was the shoulder. This cut is big and heavy, a bit intimidating and you seldomly find a recipe in Ouma’s recipe book for it. Without further a due and excuses I decided to make time and to put my shoulder in it, to show this cut who is boss. Lamb and Mutton SA has recently created a new Facebook page called Budget Cooking With Lamb to show consumers that it is possible to buy and use lamb and mutton on any budget, diet and taste, with smart planning and the right side dishes. In South Africa, Christmas means summer and summer means vacation, delicious foods and quality time with friends and family. As Christmas 2016 approached, shelves were packed with the best and sweetest summer fruits, making it more affordable for the consumer. This gave us the best opportunity to create and test lamb and mutton recipes without losing out on precious holiday and family time. The ingredients available during this time are nutritious and filling, not to mention healthy and a great addition to your vacation mode diet. The answer to a quick and healthy protein source to add to any meal is a big and flavourful cut of lamb or mutto meat. After doing a bit of research and talking to people with real know-how, the cooking of the shoulder become less daunting and I decided it would be the best cut for our Christmas food series. It is as easy as putting the whole shoulder (with the bone) in a big casserole with lekker white wine, lemon juice, herbs and spices in the oven at a low heat (about 180˚C) and basically forgetting about it for two to three hours while the flavours develop. A food blog I stumbled upon described this cut as “succulent, forgiving and kind”, which describes my experience with this wonderful piece of meat exactly. The best thing about the shoulder cut is the fact that it gives a lot of meat which is tender and succulent and does not dry out like the leg cut of a carcass. In actual fact, it is difficult for anything to go wrong during the cooking process of the shoulder. As long as you know how to switch the oven on and off, you will impress anybody with a tasty lamb shoulder. The meat from the shoulder cut has a unique sweeter taste which complements the flavours of summer dishes very well. The budget friendly Christmas dishes we selected to prepare from a single shoulder, were Tacos for two, Watermelon and barely salad for 6 people, and 8 Phyllo pastry triangles. The idea with these recipes was that people only have to cook one shoulder, remove the bone from it, and keep it in the fridge for 3 different meals. The Tacos for two is a Mexican meal with homemade mint pesto, avo and diced tomato and onion salsa (chillies if you dare). The watermelon and barley salad is a deliciously refreshing and light meal for the Christmas table or as a healthy lunch for the whole family. The combination of the shoulder meat and homemade mint pesto with mozzarella cheese, wrapped in the phyllo dough triangles, might be a combination you haven’t tried, but it is really a quick and simple recipe for on the go snacks or even a picnic basket. Even after these 3 dishes, there was still enough meat left over and because this series is about getting as far as possible with one piece of shoulder, we made some braaibroodjies just to spoil my family. Visit our Facebook page Budget Cooking with Lamb or our website www.cookingwithlamb.com for more tasty and budget friendly lamb and mutton recipes. Cut by cut Part 2: The WHAT of the sheep?? I am currently on a cullinary journey to discover the new and classical uses of the delicious cuts of lamb and mutton and to experiment with it. Join me in part two of this four part series as I discover delicious recipes and easy cooking methods for sheeps tails. There are two very important things to remember when it comes to sheep’s tails. This little piece of meat requires quite a bit of preparation and it will not be included in any type of weight loss plan. This however does not mean it is any less of a meat cut when compared to the other cuts of the carcass, and the preparation is not that complicated when preparing it once in a while for special occasions. Come to think of it, it is as easy as a pot of boiling water on the stove! Some people suggest that the tails should be cooked in Salt water – then the temperature will be higher, while other prefer to cook it in a pressure cooker. I am wary of old fashioned stove top pressure cookers and do not have an electric version in my trousseau as yet (hint-hint) and therefore prefer the saltwater method. The cooking time is about 90 minutes for the tails to be tender. When the meat pulls away from the bones it can be taken out of the water to be grilled on the braai. It was Oom Floors’ (Francois Botha) sheep tail recipe and method from the Free State that won me over. He prepared and made these little delicious tails at home to be braaied at the Bloem Show and made quite a name for himself. According to him the success of the recipe lies in the pre-cooking and the secret ingredients of is marinade and sauce. The type of sauce is really one of preference, but the timing of when you add it to the process will determine the success of the recipe. Oom Floors told me that he had accidentally determined this method, when he had to prep sheep’s tails in a hurry. It works particularly well when you dunk the boiling hot sheep’s tails (straight from the pot) into the sauce. This allows the meat and fat to absorb the flavours of the marinade. After cooling a bit, the marinated tails can be packed and frozen for a braai at a later stage. Sheep’s tails seems to only be a “foreign-food” to Gautengers. The Northern Cape locals are very accustomed with this delicacy. I had some very tasty tails at a restaurant in the Williston Mall, supplied by Karusaf. These Karoo tails were pre-cooked to perfection, seasoned with only salt and pepper and then braaied for that lekker taste of chargrilled chrunch. The salt and pepper seasoning compliments the natural flavours which are only offered by the Karoo region. The Hantam Vleisfees in Calvina is no stranger to celebrating this occasion with these meaty treats. Event hough there were about four food stalls selling skaapstertjies by 14:00 that afternoon, all tails were sold out. Stertjies are without a doubt the favourite food at these type of feeste in the platteland, loved by young and old! After my visit and experience in the Northern Cape, I was quite sadden about the fact that kids growing up in the cities are missing out on this delicious spoil. This motivated me to go and find out where in Pretoria I could find some stertjies. It’s not really an easy cut to find in any butchery or supermarket fridge. Through the power of social media, I finally found a reliable supplier in “KLH Oos-Kaap Lam”. These guys started their company as students when they realised there was a demand for the so called 5th-quarter in the city, due to the reason that it is not readily available in our butcheries and supermarkets. The stadsjapies reaped up their stock and ever since then, they almost couldn’t keep up with the demand. They very successfully run their business from their Facebook page. I think it is only a matter of time, before the food market culture in the cities, discover the taste phenomenon of these little delicacies. Until then, it will remain one of the platteland’s best untold tales. I am currently on a cullinary journey to discover the new and classical uses of the delicious cuts of lamb and mutton and to experiment with it. Join me in this four part series as I discover delicious recipes and easy cooking methods a long the way. When she got married to my grandfather, my dear grandmother Bester, wasn’t very nifty in the kitchen. Luckily, my grandfather knew how to prepare and cook a few dishes and could (like any smart man) teach my grandmother how to cook these dishes just like his mother. These recipes became the staple dishes she cooked week after week. I am convinced that Oupa, might have forgotten a few steps in the leg of lamb recipe, or the meat just stayed in the oven a bit too long while we were in church on Sundays. Whatever the reason, nobody ever said a word to Ouma about the dry and stringy meat and just drowned the plate of food in gravy. After a lot of Christmas, birthday and family dinners, I was not in the least motivated to ever cook a leg of lamb, until I discovered that the leg does not need to be in the oven for ages or dry! A leg of lamb is actually a very tender and lean (for the health conscious home cooks) meat cut and does not require long cooking times for it to remain tender and juicy when cooked. Due to the lower fat content of this cut, the leg of lamb as subtle flavours and will quickly dry out in the oven. I delved into the vastness of the internet to find and discover some secrets from modern home cooks and restaurants to prepare and cook the perfect leg of lamb. A delicious leg of lamb boils (just kidding) down to two basic principles; shorten the cooking time to prevent the meat from drying out, or boost the moisture and or flavour content of the meat. Let’s first talk about the cooking time. To shorten the cooking time is as easy as deboning the leg to either cut open, fill and roll the meat or dice it up in smaller cubes. From our very own YouTube sensation, The Bearded Chef, and well known health-cooking food personality Heleen Meyer, I learned about cutting open the leg of lamb to cook on the braai. The cooking time for this method is between 60 to 80 minutes to be medium to well done. The Bearded Chef uses white wine soaked wood shavings to smoke the meat in while it cooks in the Weber. The meat it rubbed with olive oil and seasoned with salt and pepper before placed in the Weber. Instead of serving it with the traditional mint jelly, he makes a pumpkin puree which complements the smoked meat perfectly (recipe and method on Cooking with Lamb’s YouTube channel). Heleen prefers to add a bit more flavour with a rosemary, garlic, thyme, and lemon zest herb mixture. She then rubs the herb mix, avocado oil and lemon juice on the meat, before it is placed in a closed Weber to be cooked for about 80 minutes. Because the leg of lamb is cut open, the meat is much thinner and will cook faster and more evenly than compared to a whole leg in the oven. Chump steaks are smaller lamb leg products and are very convenient for the modern home cook, to quickly cook in a pan, in the oven or on the braai. Mini-roasts are cut from a main muscle from the bigger leg cut and are normally the rump or top side cuts. The portion sizes of the mini-roasts are enough for two people to enjoy and really cooks extremely well and tender, without losing moisture and flavoursome juices. Another discovery I made is that any good butcher or restaurant makes their lamb-kebabs from the tender meat of a leg of lamb, and not the offcut pieces. A whole leg of lamb in the oven isn’t that old fashioned and still impresses when it is served at a big gathering on a beautiful plate. This perfectly fits into the rustic look and feel, which are dominating the glossy food magazines. The most important thing to remember when cooking a whole leg of lamb in the oven is to keep moisture in. I know you are probably thinking about the hassle of larding the leg with oils and chunks of fat, but that is not necessary at all – I mean who still owns a larding needle? Can you even buy it at Mr. Price Home or yuppychef.com? I found a fool proof secret to cook a juicy whole leg of lamb in the oven. The method receives a lot of commendation and is super easy and uses a salad dressing marinade. On a very popular South African recipe site, www.foodloversrecipes.co.za, people chatted about this “slaaisous” marinade. A lot of people prefer the whole leg to marinade in a Greek or Italian salad dressings overnight, while others prefer to cook the whole leg in the dressing and basting it from time to time throughout the cooking process. A very important, classical cooking tip, is to rest the meat for 15 minutes before cutting. This allows the meat juices to evenly disperse through the meat. Never cut your meat during the cooking process, as the moisture with all the flavour will evaporate and leave the meat stringy and dry. I had the opportunity to enjoy the best lamb I have ever tasted at an Indian restaurant in Johannesburg called Ghazal. This medium curry, a Lamb Korma, had ingredients such as coconut milk, ginger, chillies and nuts in. The coconut milk is perfect for adding a bit of fat to the lean meat of a leg of lamb (some recipes uses yoghurt) and compliments the other ingredients. The flavours all married well, while the meat kept its natural flavour. From now on this is the only way I will be serving my leg of lamb. How will you be doing it?